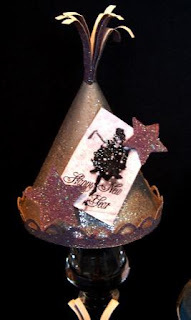 If you read my blog regularly, you know that I have mentioned 2011 has not been a banner year for me...I am so looking forward to 2012! Update: 2012 was almost as bad! Quite a few years ago, my friend and her kiddos came to visit for New Years - it was one of my favorite times ever. 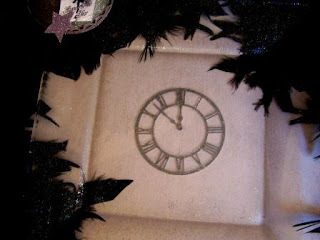 We took all the decorations off the Christmas tree (I usually do this anyway, I like the tree out of the house asap) and decorated it with black boas and we made clocks, and the kids had a fun time. 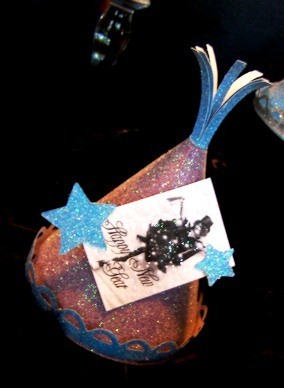 I kept remembering this as I made these projects and thinking we might have a New Years Tree again this year! And I sort of channeled my granny for one creation too! 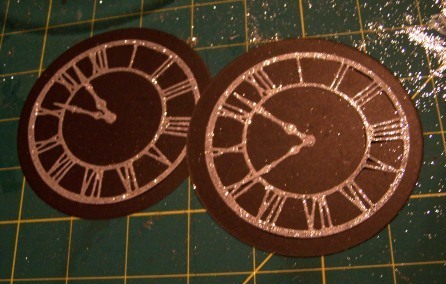 There is a lot of glitter in these projects - I did not pick the easiest paper to use...so be prepared to be glittered. My house will sparkle all year now! 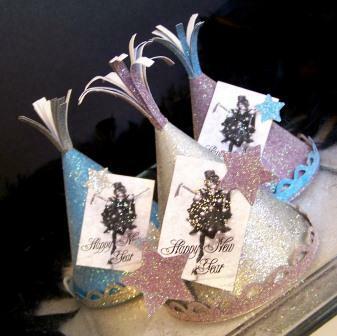 I just about squealed with delight (OK, I did) when I saw these sweet little party hats! Could they be any more fabulous! 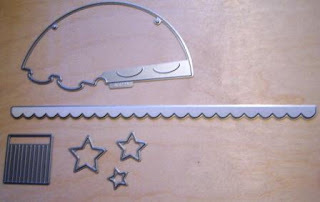 So simple to make -you really just need to cut them with the Epic 6 and assemble using the tabs and a glue stick! I happened to use this glitter paper that I got at Target...I love the way it looks, but my house may never be free of glitter. I used three colors and cut three sets of hats, one in each color. Cut each hat and assemble, using the glue stick to hold it together. For the top fringe (LOVE), I wrapped it around a toothpick an then inserted it into the top hole. A dab of glue on the inside of the hat will hold it in place. 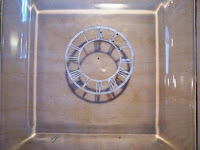 Glue the bottom detail around the base and let dry. 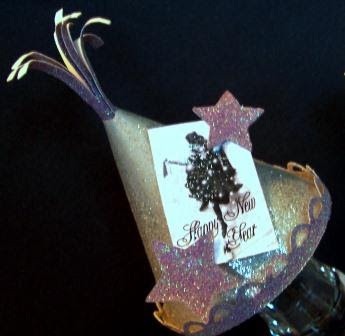 I added a vintage graphic from The Graphics Fairy, Champagne Girl and used the stars that came with the party hat to accent it. so I made a change and think it is pretty now. 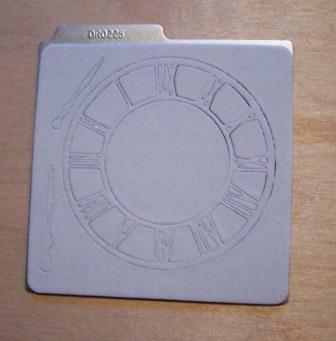 Cut clock out making sure you cut with the face of the paper down. 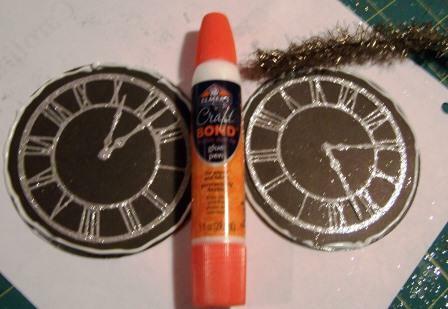 Remove clock and mix glitter with mod podge. Paint a layer of decoupage/glitter all over the back of the plate. Place hands of the clock into position, then press clock into position. 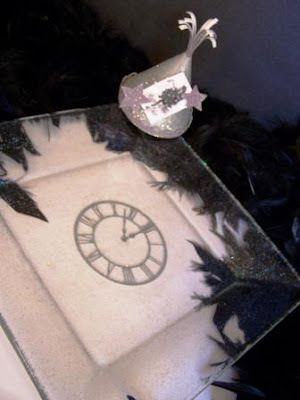 Apply another light layer of decoupage, being careful as you go around the clock, let dry slightly - some with be thicker around the edges of the design, just go slow. Let dry! placed it on this glass container for decor. at my Granny's house...I kind of love it! 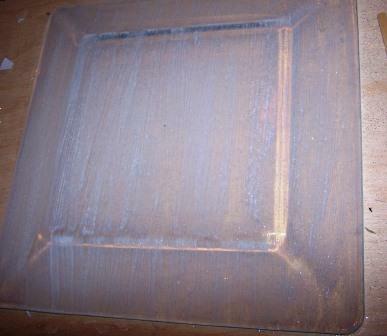 I used some vintage supplies, but you can easily substitute other items. 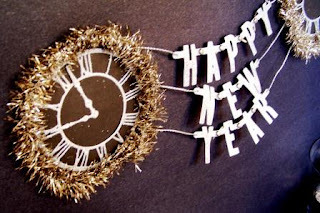 Celebrate die, clock die, die cutter, solid color card stock, decorative paper clock die, Glue pen, vintage tinsel (or ribbon or modern tinsel), brads (mine are from 7Gypises), silver string. 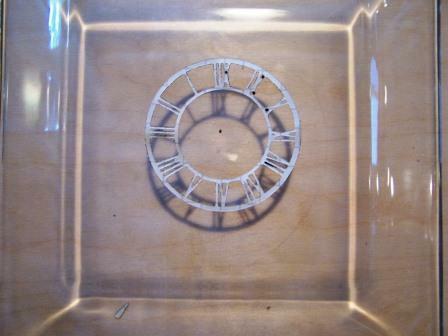 Glue clock face and hands to the circles and let dry. 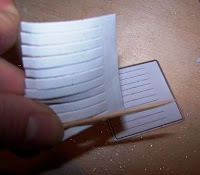 Place a line of glue around edge of large circle and apply tinsel (or ribbon or other trim) around the outside edge. Let dry. Cut desired letters out of decorative paper and determine placement/style of banner. I decided to do a triple banner. Attach letters together using the brads. 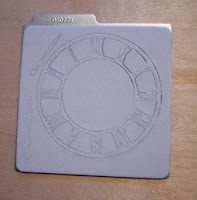 Attach words to clocks by laying out on a table and determining the placement. When you like the placement, glue the string to the clock, or punch a small hole, and tie off the string. There ya go...happy new year! I cannot wait to see what 2012 has in store! There is also a weekly contest. Make a facebook status about the contest. The contest will runDecember 13-19. OMG -- gorgeous. I'm so jealous -- I want those dies and that machine too! Warning: Cheesy pun ahead...avert your eyes if you're lactose intolerant.......those dies are TO DIE for! As a family, we don't do much for New Year's, but your craft ideas would be neat to try. Thank you so much for sharing! 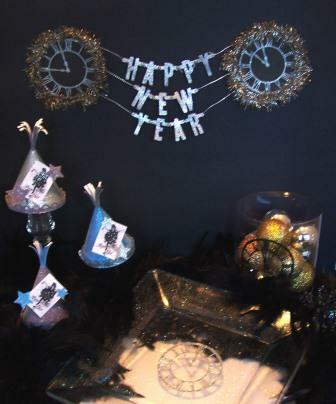 NYE is something I want to celebrate more and I am totally jealous of your awesome dies and machine! 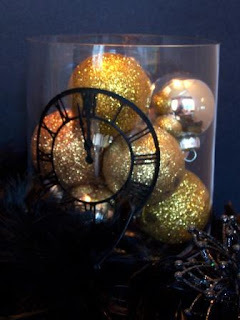 Cool, and here you are already on the ball for New Years!